I LOVE coffee. Which is an extreme understatement. So when I received the opportunity to work with Two Rivers Coffee on a review, I was very excited. 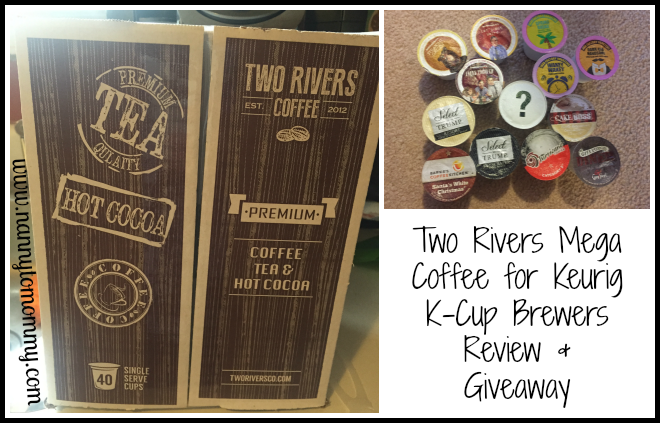 I recently was sent the Two Rivers Mega Coffee for Keurig K-Cup Brewers to review. Not only is this coffee tasty (what I have tried so far), this coffee is also simply cool. It's cool because you get to try 40 different kinds of coffee without buying 40 boxes, but the names are cool as well. With different types from Brooklyn Bean Roaster, Hamilton Mills, Java Factory, Select by Trump, Workaholics, Guy Fiery, Cake Boss to just name a few. It also comes with a variety of selections: Dark Roast, Medium Roast, Light Roast, Extra Bold, Flavored, Unflavored, Decaf. I love the taste of coffee and just want a cup, but don't want all the caffeine. Although I rarely drink decaf, it's nice to have it available. It says it's compatible with Keurig Original K-Cup brewing systems; Not compatible with Keurig 2.0 Brewing System, BUT if you take the top of a Keurig brand k-cup, then you can make it work with the 2.0! I'm still trying the different varieties, but my favorite so far is the Brooklyn Bean Roastery Cornor Donut Shop. YUM! One winner will receive a 40 ct. variety pack from Two Rivers Coffee. Giveaway open to US only, must be 18+ to enter. Entry is simple just follow the prompts on the Rafflecopter below. I am interested in trying the Dark and Handsome flavor. I would like the Cake Boss and Java Factory. I like anything that’s a lighter to medium roast. I'd like to try the Cake Boss Flavored Coffee. I love anything dark roast! I checked them out on Amazon and there are a lot of flavors that sound great! I'd like to try the Sinful Cinnamon because I think it would be a little bit different. I'm very interested in trying the flavor Straight Grizzly Coffee. I would like to try any of the dark roast flavors. I would like the Toasted Cinnamon flavor. Would love to try the Cake Boss! I would love to try the Cake Boss flavor. I would love to try the choconut flavor. I would love to try the cake boss. This would be neat to try out new flavors. I would love to try the Cake Boss flavor. I love the Cake Boss! Im most excited for Choconut!! Two of my favorite flavors mixed together!! It has to be fabulous!! I'd really like to try the Cake Boss Flavored Coffee. I'd love to try the Mocha Swirl. I would love to try the cake boss flavor! I'd love to try Java Factory Trick or Treat! I'd like to try the Brooklyn Bean Carnival Hot Cocoa. I think I would enjoy the Brooklyn Bridge coffee. I am excited to try out the vanilla bean flavor. I'd love to try the cake boss! I am interested in trying Sinful Cinnamon. I want to try Cake Boss Chocolate Fudge Cake! Choconut and trick or treat sound delicious. I'm interested in trying the Java Factory's Spring Break flavor. Would love to try the Corner Donut Shop....sounds yummy! I love coffee. I would like to try the Choclate fudge cake. Yum! I'd love to try the vanilla jack o lantern! Sounds good! I'd like to try Wakey Wakey. It sounds like a good way to start the day. Straight Grizzly flavor probably would help me in the morning! I love to try the Spring Break flavor. I am most excited to try Brooklyn corner donut shop flavor coffee. 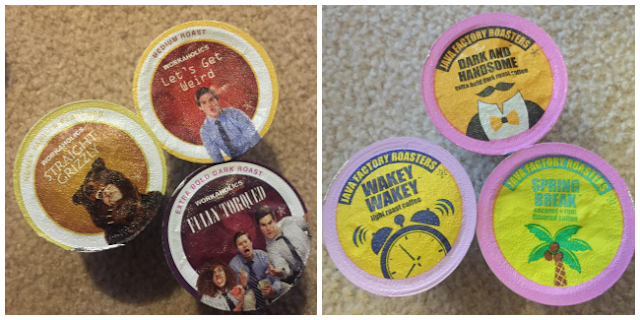 I'd like to try the Let's Get Weird medium roast flavor. Thanks. the cake boss looks really good, though i dont usually do "fl;avours"
Corner Donut Shop sounds like it would be good. I have never heard of this brand of k cup coffee. I love my Keurig!! My favorites are the flavored coffees, like Hazelnut and Vanillas. I also like the hot chocolates and teas. I will check this brand out!! I would love to give the Toasted Cinnamon a try. I would try any of the flavored coffees first. I would like to try the Dark and Handsome flavored coffee. Thanks for the chance. I would like to try the dark and handsome. I think the cake boss flavors sound yummy! I want to try the extra bold Dark and Handsome. Cute name! Corner Donut Shop from Brooklyn brand....I've tried that one before and it's good. All of the workaholics flavors look amazing! My husband would love this. I would love Corner donut shop! I'd like to try the Straight Grizzly. I'm definitely a grizzly when I haven't had my morning coffee! I'd like to try the Let's Get Weird, the Cool Cafe Blues and Trick or Treat blends. I'm not a fan of flavored coffee but that's what's so exciting about the sampler pack, who knows, I could find a new flavor I love. I am interested in the cinnamon ones. My husband would like the Dark and Handsome. I'd love to try the vanilla bean flavor! I've yet to find a kcup vanilla that doesn't taste overly fake. I would like to try golden maple. I would love the dark and handsome. I would love to try the Cake Boss! I would love to try the Dark and Handsome. I like my coffee strong! I would love to try the dark and handsome. I love dark roast coffee. Thanks. I would love to try the Cake Boss coffee. The cinnamon is my second favorite. I would like to try Dark and Handsome. Loos like a coffee I would really enjoy! I think the Vanilla Skyline would be what I would love to try first! I am interested in rying Wakey Wakey! I'd like to try anything that's a medium roast. I want to try the straight grizzly coffee. I would love to try the Guy Fieri or Cake Boss flavors! I am most interested in french vanilla. I would like to try hamilton mills wild raspberry. I would love to try Cake Boss -- Chocolate Cannoli. I'm most interested in trying "Wakey, Wakey". Oh I would love to try each and every single one of them but the one I'd like to try first would be "Let's Get Weird". That's just the most brilliant coffee name ever! Thank you for the giveaway chance and have a happy day one and all! I would love to try the Cake Boss Vanilla Buttercream flavor!!! I would love to try the Wakey Wakey. I'm excited to try the Sinful Cinnamon. I want to try the Hot Fudge brownie! Yummy! I am most interested in trying the Brooklyn Corner Donut Shop! The Cake Boss one sounds yummy! I love sweet flavored coffee! I would really like to try the Java Factory it sounds really good. I want to try Wakey Wakey! It would be fun to try this sampler! I would love to try Cake Boss. Bet it's yummy. I am most interested in the Donut shop and dark and handsome. I want to try the Grizzly!! So many sound good but first the dark nd Handsome for me! Let's get weird sounds weird. I want to try that one first. I would like to try the Java Factory Vanilla Dream. I need some of that dark and handsome in my life! I would like to try the Dark and Handsome. What a fun name! I do like my coffee really strong, so I am sure I'd love it. I would love to try the dark and handsome. Thank you for the entry. I don't know! I'm boring so maybe the Brooklyn Bean Roaster. I'd love to try the Spring Break flavor especially, but all of them are intriguing! I would like to try any of the flavors, I'm not picky when it comes to coffee!! Thanks! The corner donut shop sounds perfect. I love donuts!